Two very likeable stars, Viola Davis and Maggie Gyllenhaal, anchor an earnest tale of school reform. Media attention, such as it is, has focused on the problematic American educational system. 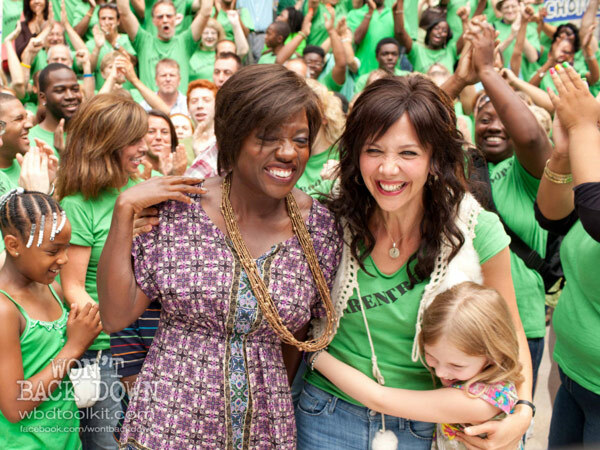 Nona Alberts (Viola Davis) and Jamie Fitzpatrick (Maggie Gyllenhaal) are mothers with problem children. Nona’s son Cody is considered to be “slow” and Jamie’s daughter Malia is dyslexic. Nona teaches the second grade at the same school that Malia attends but the dyslexic girl is stuck with a bored teacher who is unwilling to help her. Feisty Jamie tries to get her daughter into Nona’s class but the principal won’t allow it. Frustrated, both Nona and Jamie try to place their children in a progressive charter school but they’re unsuccessful. Angry, Jamie decides to take on the system. She finds out about the parent trigger law, which was passed in several states in the past few years. The law allows parents to fire under achieving administrators and teachers, converting unproductive public schools into free charter ones. Maggie Gyllenhaal turns in a spirited star turn as Jamie Fitzpatrick, a single mom who works two jobs and is unflaggingly cheerful and optimistic. Offered small shadings to her character, Gyllenhaal does what she can with the notion that she thinks of herself as dumb—possibly not worthy of having one teacher as her best friend and another (Oscar Isaac’s Michael) as her new boyfriend. Trouble is, it’s hard to read Gyllenhaal as anything but clever, leaving Jamie as a one-dimensional figure of unflagging feistiness. Viola Davis does much better with her slightly cardboard character. Davis is particularly convincing when she allows herself to be seduced into action by the zealous Jamie. You can see it in her face as she slowly begins to believe that her long suppressed hopes for school reform might actually take place. This film revolves on a question: who is to blame for the decline in American schools? The film points its finger at the unions, creating an obviously problematic character, Evelyn Riske (Holly Hunter). Ms. Riske (what a name!) is a former schoolteacher, who is now an almost Mephistophelian figure, working for the union. In a key scene, she tries to buy off Jamie by offering her the financial opportunity to have Malia go to a private school, where she can learn to deal with her dyslexia. One has to ask: when did the unions become the villains in the struggle for better public education? Won’t Back Down’s writers are clever enough to pose that question, too. They don’t really answer it and as the film reaches its denouement, it’s the unions that emerge as the bad guys. I have a real problem with that political position particularly when it isn’t backed up with facts. Won’t Back Down wants to be the kind of sincere didactic film—To Sir With Love, Up the Down Staircase—that audiences loved a generation ago. But the filmmaker’s sketchy understanding of the genuine problems in public education and the one-dimensional nature of most of the movie’s characters make Won’t Back Down a well-meaning failure. We’ll have to wait for a better film on the perils of the American public school system.